Do you have a small bathroom that doesn’t have a lot of space in the shower? I am stumbling over everything in the shower because I have so many bottles of shampoo, conditioner, body wash, and facial scrubs sitting around. The best way to declutter and organize your shower is with a shower caddy. Shower caddies come in many shapes, sizes and colors. If you have never used a caddy, then you probably don’t even know where to begin in your search. We have reviewed 12 shower caddies and have shared below our findings. Look at these products and hopefully you will find one that will solve your shower space issues! InterDesign brings us this fabulous bronze York Lyra shower caddy. 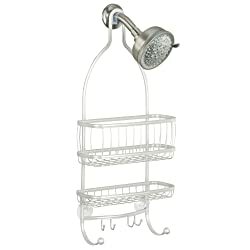 You can place this large caddy over any shower head to give you additional storage while you are in the shower. It has a deep basket and a small shelf with metal wire to allow water to drain out appropriately. This is ideal for placing your shampoo, conditioner, body wash, shaving creams and more. The rust-resistant bronze finish matches any bathroom decor. There are small hooks on the bottom of the caddy to hang razors, towels, loofahs and brushes. Suction cups on the lower section of the caddy help to hold it in place against the shower wall. The suction cups work well for tile showers or fiberglass. 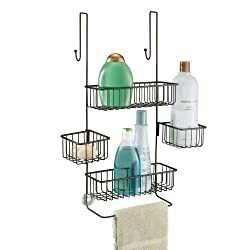 If you are tired of not having space in your shower to store everything, consider this bronze wire caddy from InterDesign for organizing all of your shower products. You can place this expandable shower caddy over any shower head to give yourself more storage space in the shower. This caddy has a chrome rust-resistant finish to give you a sleek addition to your bathroom fixtures. There are four large baskets that shift outward from the center allowing you to use this caddy with large bottles. It is also a great solution for hand held shower head applications. A large center hook allows you to store your hand held shower head when it’s not in use. This caddy has an exclusive swivel lock non-slip collar to help keep the caddy in position on the shower head bar. Suction cups on the back of the caddy keeps it in a fixed position to prevent swaying. Four small hooks give you additional space to hang loofahs, razors, brushes and more. This shower caddy is a great space-saving solution and provides you with the additional storage we all crave in the shower. This corner shower caddy gives you extra storage in your shower without taking up much space! It comes with four individual poles to meet the requirements of different installation heights. The poles are made with galvanized and brushed stainless steel. High-compression springs allow the bars to fit together tightly and ensures that the pole will never collapse. There are four heavy duty shelves with durable rubber rings to hold each shelf in place. You can move the shelves up and down to make enough room for tall bottles. These shelves will never rust and are very easy to clean. Each shelf is 13-inches wide in the front, 9-inches on the sides and 1.65-inches deep. Small holes in each shelf allows water to drain out automatically. Protective barriers on the front of each shelf prevents items from falling off while you are taking a shower. If you need a shower storage solution that will give you a lot of space, then consider this corner shower caddy from ALLZONE. The Metalo shower caddy is a great storage solution for all of your shower items. This product from InterDesign features four shelves, a washcloth bar and two external towel hanging hooks. This steel caddy has an elegant bronze finish with a rust-resistant coating. You can move the two middle shelves to the side which will allow you to store tall bottles on the shelf below. You can place this caddy directly over your shower door for easy access while you are showering. It will fit shower doors up to 2-inches thick. This shower caddy is 22.75-inches tall by 10.5-inches wide. There is a slender bar at the bottom of the caddy where you can place a washcloth. The caddy has two external hooks on the other side of the shower door for hanging large towels. This shower caddy is a perfect solution for you to free up space in your shower and to provide additional room for hanging towels. If you are looking for a shower caddy that will not slide down your shower arm bar or swing around then consider this product from simplehuman. The stainless steel construction of this caddy makes it corrosion-resistant and easy to clean. The adjustable shelves allow you to slide them up and down the center bar to make room for tall bottles. This shower caddy has a very secure installation mechanism to hold the shower caddy in place. A rubberized shower head clamp holds the caddy in place on the shower bar arm. There are two pivoting suction cups at the bottom of the caddy to support it from below and prevent it from swinging. You can keep your bar soap dry by using the quick-dry soap dish on this caddy. It will drain the water completely from the soap dish allowing your bar soap to stay dry and last longer. 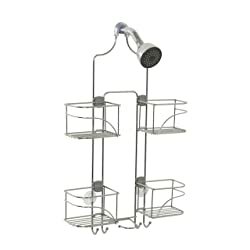 This shower caddy is a 15-inch wide shelf or basket that attaches to the wall of your shower with suction cups. The basket is made of rust-proof stainless steel and the suction cups are rubber with a plastic chrome covering. These baskets will fit in nicely with any bathroom and shower decor. This product works best on smooth surfaces such as tile or glass. You will get two stainless steel baskets with this product to give you more storage space in your shower. You will have so much storage space with this shower caddy you may not be able to use all of it! This caddy has 6 angled shelf baskets to store shampoo and body wash bottles. There are 2 flat storage shelves perfect for bars of soap or loofahs. You also get 2 double hooks positioned to hold razors or brushes if needed. This caddy features a strong suction cup and rubberized no-slip grip at the top to keep the shower caddy securely in position. The center section of this caddy is open making this a perfect solution for hand held shower heads. The open hanger style top on this shower caddy allows you to hang this on rain-style shower heads. mDesign makes this shower caddy out of strong steel wire with a durable rust-resistant finish. 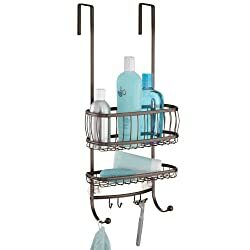 If you are looking for a shower caddy for dorm room living, then this is a perfect solution since multiple people can easily share this caddy. This shower caddy helps you keep all of your shower products within arms reach. The caddy features 3 shelf baskets for storing shampoo, conditioner, body wash and more. There is a towel bar and two small hooks for hanging razors or brushes. mDesign created a perfect solution for getting every last drop of shampoo out of the bottle. You can stand the bottle upside down in the basket, and the design of the shelf will hold the bottle in place! The no-slip grip hanger at the top of the caddy will prevent it from sliding down the shower arm. Two strong suction cups at the bottom help keep this caddy securely in place. The open grid design allows for air circulation and water drainage to reduce mold and mildew buildup. If your shower enclosure is white, then consider this pearl white shower caddy from InterDesign. They have made this product with a durable rust-resistant finish including a ThermaBond coating. 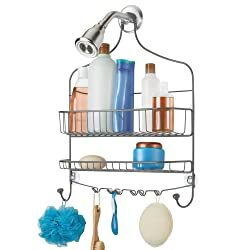 This caddy comes with two shelf baskets and hooks to hang razors, loofahs, brushes and so much more. You can use the larger basket to store shampoos and other large bottles while the smaller basket can hold bar soap and other smaller items. This shower caddy will help you keep your shower clutter free and save space at the same time! If you need a lot of storage space in your shower, then this extra-wide caddy from mDesign may solve your problem. This shower caddy offers a large wide basket on the top for storing tall shampoo and body wash bottles. A second basket is a little shorter for holding bars of soap, creams and other small objects. The caddy also has a large hook on each end and six smaller hooks in the middle for hanging razors, loofahs, washcloths and more. The no-slip grip at the top of the caddy helps prevent it from sliding down the shower arm. Two suction cups at the bottom allow you to fix the caddy against the wall to prevent a swinging motion. mDesign makes this shower caddy from sturdy, steel wire with a durable rust-resistant finish. Consider this shower caddy for organizing all of your shower products in one place. You can easily organize your shower products and free up space with this fabulous shower caddy from simplehuman! This shower caddy is comprised of a reinforced aluminum pole with a high-compression spring inside. The pole has rubber feet that will grip your shower floor and ceiling surfaces. This pole can extend from 6-feet up to 9-feet. There are three adjustable shelves which can slide up and down the pole to make room for taller and larger shampoo bottles. Special cut-out holes allow you to store your shampoo bottles upside down to get the very last drop of shampoo! Towel hangers can clip anywhere along the pole and are ideal for washcloths. Storage hooks allow you to hang razors, loofahs, brushes and so much more. The durable stainless steel construction is corrosion-resistant and easy to clean. Declutter your shower space with this tension shower caddy and the results will not disappoint you! 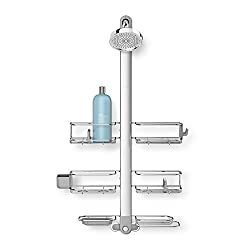 This simplehuman adjustable shower caddy allows you to organize your shower space and keep everything within easy reach. This caddy has four shelf baskets for storing shampoo and body wash bottles. You can even store bottles upside down for quick access. The neck of this caddy extends allowing you to store tall bottles on the top shelves without any problems. There is a rubberized shower head clamp that attaches the caddy to the shower arm at the top and keeps it from sliding down. Two pivoting suction cups are attached at the bottom of the caddy to prevent it from swinging side to side. The wire shelves are adjustable and can easily slide up and down to make more room. This caddy is designed to be used with hand held shower heads. The center of the caddy offers room for the flexible hose from the showerhead. The stainless steel and anodized aluminum construction of this caddy is rust-proof to give you years of worry free use. If you have a child heading to college soon, you are probably asking what is the best shower caddy for college? Whether you are looking for an organizing caddy for the college dorm or for your own home, there are several tips and guidelines to consider before you make a choice. Shower head hanging shower caddy – This is the most popular shower caddy available. It hangs directly on the shower arm above the shower head and keeps all of your shower products right at your fingertips. 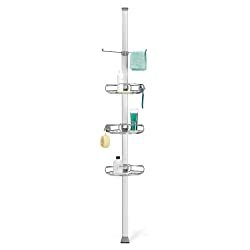 Tension pole caddy – If you have multiple people using the shower, consider this type of shower caddy. It rests in the corner of your bathtub or shower stall and is held in place by a high-compression spring inside the tension bar. Shelves are affixed to the pole allowing you to store several bottles and other shower products. 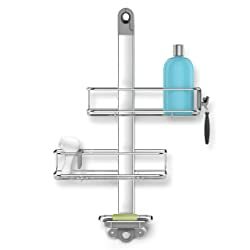 Over the door caddy – This type of caddy is placed directly over the shower door and keeps the products more out of the way from direct water spray. It only works with showers that have physical doors. Suction cup shelf caddy – The suction cup shelf caddies are great products since you can place them anywhere in your shower stall. This is a smaller option for shower stalls in which space is limited. They only work well on flat surfaces. There are many other types of caddies, but this gives you an idea of the more popular choices that are available. Many caddies are made of plastic, but these do not last as long and can be a trap for mold and bacteria. If you choose a plastic caddy, consider changing it for a new one regularly. 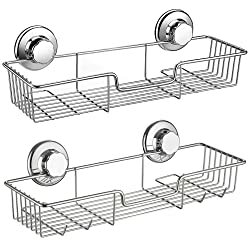 Metal shower caddies are the most popular on the market. Metal increases the durability of the shower caddy and makes it stronger so you can store heavier products on it. Be careful with some metals because they can rust and leave unsightly stains in your shower. You can find a shower caddy in nearly any color imaginable. Chrome and white caddies are the most popular. You can find caddies that are bronze, gold and even black. Choose a color that will blend in the best with your bathroom decor. The most important feature to consider when buying a shower caddy is the location where it will be installed. You want to pick a caddy that will work the best with your shower stall configuration. We hope that the product reviews and feature guidelines will help you make the best choice for your bathroom. Get ready to declutter your shower and get organized with your new shower caddy!